Students and teachers at the Brades Primary School were treated to lunch on Wednesday, courtesy of the John Sweeney Montserrat Fund. 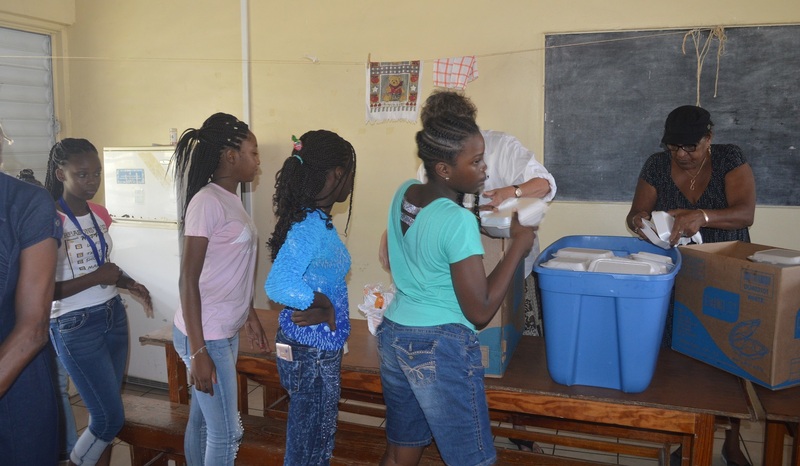 A total of 200 lunches, which include fish, burgers and hot dogs along with cold drinks were donated to the school from the Canadian-based Montserratian. Local representative for the charity Elizabeth Piper-Wade said Mr Sweeney simply wants to give back to the island which molded who he has become. She said one of his fondest memories was of someone donating to his school as a child and the way it felt to have such a wonderful treat. He wanted to do the same for the children of Montserrat. Piper-Wade said plans are in the works to make a similar contribution to another local school. The John Sweeney Montserrat Fund set up in 2017, has also made donations to the Emerald Community Singers, the Montserrat National Trust, Cecil Cepeke Lake Medical Fund, Meals on Wheels and to the Small Beginnings Band to purchase new instruments. It is an apolitical organisation focused on helping not for profit entities and people in need.